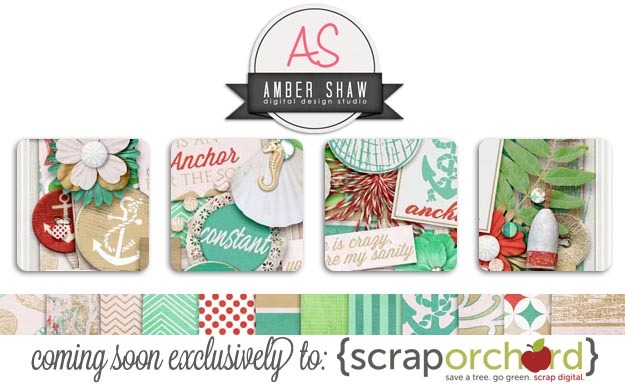 designsbyambershaw: Sneak Peek and a chance to win!! Sneak Peek and a chance to win!! I have a kit coming this week and through Thursday 11:59 pm you may enter to win by at least commenting about Who or what anchors you during crazy times. You may also enter by tweeting or liking my FB fan page. (see Rafflecopter entry options below) Good luck! My husband keeps me anchored!..thanks for the chance to win. I love that the colors aren't ocean blue, lol. Looks beautiful! Thanks for the chance to win! My husband does a pretty good job of keeping me anchored, but a day out on the boat fishing and crabbing doesn't hurt either. Would love a chance to win your kit, it looks perfect for a lot of pictures I have and want to scrap. Thank you! So looking forward to this one! Preview looks amazing. Thanks for the chance. What keeps me anchored is the thought and support of my family but also: music (backstreet boys in particular) and scrapping. My sister keeps me anchored. She always knows what to say even in the most difficult times. BTW, this kit is beautiful. The colors are so serene. Thanks for the chance. Sneak peak looks fantastic! Thanks for the chance to win it! Can't wait to see it! Thanks for the chance. Love all the different anchors. Can't wait to see the rest. Love the colors...can't wait to see the final outcome. thanks for the chance to win. My husband is quite a calm and balanced kind of a person and he can keep me anchored, but sometimes, getting angry is for me - strange as it may seem - one of the ways to cope with craziness in life. :-) Thanks for the great chance to win your upcoming kit. Hope you'll too always have something or somebody by your side to keep you anchored. The person in my life who keeps me anchored is definitely my husband. Then something I can do to ground myself is take a few moments and write in my journal. This look so calm and serene... beautiful! My family anchors me during crazy times, well unless they are the cause of the craziness, LOL. Looks like a cute nautical theme. My husband, and my medication! Sneak Time!!! Comment for a chance to win! TWO New Releases - 1 with Bella Gypsy!